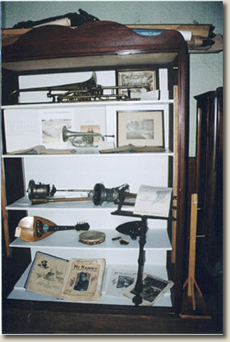 Upon entering the upstairs Grange Hall, the first display area encountered is one dubbed "Old Tyme Music". Some shelves in the glass-doored cabinet display old musical instruments, antique music books, and vintage band photos, while others hold metal torches once carried in local parades. Some old music stands propped against the shelf edges display the craftsmen's ability for artistic detail on utilitarian objects.